In a heatproof bowl set over simmering water, heat the cream until hot to the touch and turn off the heat. Meanwhile, chop 350 grams of the milk chocolate into small pieces. Add the chocolate and butter to the hot cream, and stir until the chocolate melts. Place the raisins and rum in the bowl of a mini food processor or blender and process until the raisins are finely minced. Stir the raisin mixture into the chocolate mixture and set aside at room temperature for at least 6 hours or overnight to cool. Using a 1 1/4-inch ice cream scoop, scoop balls of the rum raisin mixture and place them on sheet pans lined with parchment paper. To make the tempered chocolate, chop the remaining 400 grams of milk chocolate and place 3/4 of it in a small glass bowl in the microwave for 20 seconds exactly. Stir the chocolate and continue to microwave for 20 seconds at a time, stirring in between, until the chocolate is smooth and shiny. Add the remaining 1/4 of the chocolate and stir until smooth. The chocolate should register 85 to 89 degrees F on a candy thermometer. 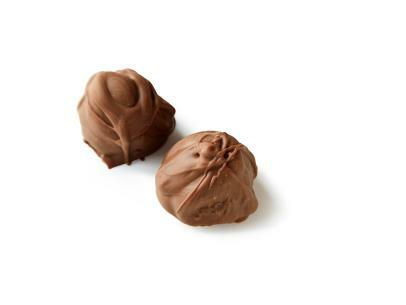 With 2 small spoons, pick up each ball and cover it with tempered chocolate. (You can also use your hands to coat them.) They can look a little messy and "truffle" like. Place the truffle back on the parchment paper. Continue to coat each of the balls until they're all coated with milk chocolate. Allow to sit for a few minutes until the chocolate hardens. Serve at room temperature.